Section of Laparoscopic and Robotic Surgery, Glickman Urological Institute, Cleveland Clinic Foundation, Cleveland, Ohio, U.S.A.
Because every urologist has studied gross anatomy and basic surgical abdominal anatomy during general surgery and urology training, this chapter details urologic laparoscopic abdominal anatomy. A clear and confident understanding of surgical anatomy and anatomic interrelationships is a prerequisite for performing laparoscopic surgery. The surgeon must understand the anatomy of the operated organ and its relationships with surrounding structures and what potential pitfalls exist. These topics will be reviewed in the following order: organ (kidney, adrenal), type of approach (transperitoneal vs. retroperitoneal), and anatomical caveats. The first step in any approach to the right kidney is mobilizing the ascending colon off Gerota's fascia. One must remember that the gonadal vein can insert into the right renal vein, though its typical insertion is to the inferior vena cava. This is important as one may confuse the renal vein for the inferior vena cava. The right kidney, when viewed in the transperitoneal approach, lies posterior to the ascending colon, inferior to the liver, and anterior to the psoas muscle. Laparoscopically, the defined layer of Gerota's fascia is clearly separate and evident from the mesenteric fat of the left mesocolon. The lateral border of the second portion of the duodenum may be attached to Gerota's fascia. When the duodenum is released from Gerota's fascia sharply (avoiding cautery so as to avoid thermal injury to the duodenum), the inferior vena cava comes into view. The gonadal vein and ureter lie directly on the psoas muscle. The gonadal vein is encountered more medially and posteriorly than the ureter in most cases. One must also beware that a relatively common venous abnormality is for the right gonadal vein to drain into the right renal vein, rather than the more usual inferior vena cava. The renal vein is seen anterior to the pulsations of the renal artery. With the 30 degree laparoscope rotated to the 9 o'clock position, the posterior relationship of the renal artery to the renal vein is well appreciated. Anomalous accessory renal arteries and the often accompanying accessory renal vein are present in approximately 20% of patients. After the surgeon obtains proper retroperitoneal access, the psoas muscle becomes the horizontal floor of the surgeon's view. This horizontal orientation must be maintained at all times. The renal vein cannot be fully visualized until the renal artery is completely dissected. In order to see the bulk of the kidney and to get adequate anterior traction on the kidney, one must recognize the bands that attach Gerota's fascia to the psoas fascia. These bands must initially be incised sharply, followed by blunt dissection in order to get separation of the kidney and its investing Gerota's fascia from the fascia of the psoas muscle. The main renal blood vessels are encountered at a view such that the laparo-scope is at a 45 degree angle with the body's horizon. Here the pulsations of the renal artery can be detected. Because this is the retroperitoneal approach, the renal artery is seen prior to the renal vein. The renal vein cannot be fully visualized until the renal artery is completely dissected. After the renal artery is clipped and divided, the renal vein is seen more medially and superiorly. In this perspective, the ureter is seen just anterior to (above) the inferior vena cava. The gonadal vein is seen further anterior to the ureter. The kidney and investing Gerota's fascia can be dissected sharply from the peritoneum by incising the thin, bloodless areolar tissue between the two. One must identify the gently undulating venous pulsations of the inferior vena cava early in the operation. If this is not appreciated, one can inadvertently dissect posterior to the inferior vena cava in a retrocaval fashion. Additionally, there have been reports of inadvertent transection of the inferior vena cava via the retroperitoneal approach (inferior vena cava transection in the transperitoneal approach has also occurred). The sentinel points for avoiding this complication are three-fold: (i) identify the cranial and caudal right angle junction of the right renal vein to the inferior vena cava; (ii) ensure the horizon of the camera is properly oriented by seeing the psoas running horizontally; (iii) visualize the renal vein coursing toward the kidney (toward the top of the television monitor). The left kidney lies behind the descending colon, anterior to the psoas and caudal to the spleen. The anatomic relationship of the superior mesenteric artery and the left renal vein is occasionally appreciated during left-sided transperitoneal laparoscopic donor nephrectomy in which left renal vein length is maximized by ligation at the interaortocaval region. The spleen lies directly adjacent to the superior pole of the kidney and should be mobilized away from the kidney early on in the dissection to avoid splenic injury. The renal vein is seen lying anterior to the renal artery. Although not commonly seen in most laparoscopic cases, the superior mesenteric artery, which courses directly anterior of the medial-most portion of the left renal vein, must always be kept in mind. The anatomic relationship of the superior mesenteric artery and the left renal vein is occasionally appreciated during left-sided transperitoneal laparoscopic donor nephrectomy in which left renal vein length is maximized by ligation at the interaortocaval region. The lumbar vein is best seen with gentle anterior traction on a clipped and ligated left gonadal vein. common on the right renal vein. The lumbar vein location relative to the gonadal vein is more variable. It is a good idea to have a nasogastric tube placed to keep the stomach decompressed. Although uncommon, the body of the stomach at times can lie just cranial to the upper pole of the left kidney. As stated above, the lumbar vein runs directly posterior from the posterior surface of the left renal vein. When specific identification of this vein is required, as during a laparoscopic donor nephrectomy, it is good to place a Weck clip on the gonadal vein, leaving approximately a 2 cm stump attached to the renal vein. This can serve as a handle to obtain anterior traction on the renal vein, revealing the posterior lumbar vein (and potentially its branches). 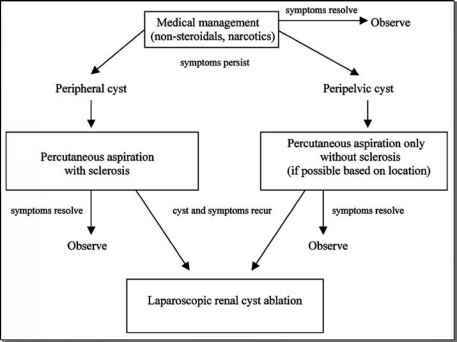 The retroperitoneal approach to the left kidney differs from the right in several critical aspects. First the aorta, rather than the inferior vena cava, is the horizontally running major vessel. Its sharp, horizontal pulsations are easily appreciated when the kidney is lifted anteriorly away from the psoas muscle. Although the renal artery pulsations are again seen when the laparoscope is at a 45 degree angle to the body, in the retroperi-toneal view, the surgeon sees the renal artery lying superior (to the right on the screen) and slightly posterior to the renal vein. On the left side, the renal vein and artery can be seen at the same time running parallel to one another. As described above, this is not the case on the right side. Additionally the level at which the renal vein is ligated and transected is more lateral (toward the kidney parenchyma) than when the renal vein is transected on the right side. As a result, the adrenal vein usually enters the renal vein medial to the ligated renal vein. This has consequences when performing an adrenalectomy with the nephrectomy (see Left Adrenal Gland: Retroperitoneal below for details). At times a lumbar vein will be seen in the retroperitoneal approach. This should be ligated after the renal artery is controlled. When the lumbar vein is adequately controlled, the renal vein releases, facilitating further renal vein dissection. Although it is rare and difficult to visualize the superior mesenteric artery via the retroperitoneal approach, the surgeon must be ever mindful of its anatomical location to ensure its safety. The superior mesenteric artery runs anterior to the aorta and medial to the renal artery. Therefore one should not dissect medial to the renal artery and vein, so as to avoid entering the superior mesenteric artery territory. Medial attachments of the kidney to the aorta or posterior peritoneum should be approached from an anterior and lateral approach (over the kidney rather than under the kidney). This enables the surgeon to appreciate the attachments that run exclusively to the kidney, thereby avoiding the superior mesenteric artery. The same principle holds true for left adrenal gland dissection as described below. The medial portion of the adrenal gland abuts the inferior vena cava, and at times a significant portion of its parenchyma can be located retrocaval (posterior to the inferior vena cava). The right adrenal gland lies cranial and slightly medial to the superior pole of the kidney. The medial portion of the adrenal gland abuts the inferior vena cava, and at times a significant portion of its parenchyma can be located retrocaval (posterior to the inferior vena cava). Superiorly, the adrenal gland abuts the under surface of the liver. Laterally, the adrenal gland is bounded by the most inferior portions of the diaphragm and the lateral abdominal wall. Posteriorly, the adrenal gland lies atop the psoas muscle. It receives collateral blood supply from small arterial perforating vessels originating from the inferior phrenic artery, the aorta, and the right renal artery. Specific and identifiable arteries to the adrenal gland are usually not appreciated. Controlling the adrenal vein before any mobilization is preferable. If the vein tears, it will avulse at its junction to the inferior vena cava, which can lead to significant and difficult-to-control bleeding. The inferior vena cava acts as the "highway" to the adrenal vein, which is usually seen in the retroperitoneal approach to be coursing anterior-medially when anterior traction is put on the adrenal gland. There is a single, short adrenal vein that drains directly into the inferior vena cava. The adrenal vein originates from the superior, medial aspect of the adrenal gland. This vein cannot be seen without significant cranial mobilization of the liver. This is the author's preferred approach to most operations of the right adrenal gland. Three major anatomically related advantages that enable rapid and safe right retroperitoneoscopic adrenal surgery are: (i) no requirement for bowel and liver mobilization; (ii) rapid identification and control of the adrenal vein; (iii) direct access to any retrocaval portion of the adrenal gland to ensure complete resection in case of cancer surgery. As is the case for all surgery, one must have a clear understanding of the retroperitoneal anatomy and the relation of the right adrenal gland to surrounding structures. The right adrenal vein is best approached by first noting the location of the right kidney hilum. This is performed as described above. If one then dissects immediately superior to the right renal vein and dissects directly along the inferior vena cava in a cranial direction, the adrenal vein will come into view. The inferior vena cava acts as the "highway" to the adrenal vein, which is usually seen in the retroperitoneal approach to be coursing anterior-medially when anterior traction is put on the adrenal gland. Of course, the direction in which the adrenal vein is seen is entirely dependent on the vector of traction the surgeon puts on the adrenal gland itself. As is the case for the renal vein, the cranial and caudal junctions of the adrenal vein to the inferior vena cava must be seen before ligating the adrenal vein. If one dissects to far cranially on the inferior vena cava, superior to the adrenal vein, the hepatic veins will be encountered. The adrenal gland is then mobilized by freeing it from its cranial attachments to the peritoneum and diaphragm. Next the adrenal gland is typically mobilized by freeing it of its anterior attachments to the peritoneum which is typically a bloodless, areolar tissue. Finally, the last attachments of the adrenal gland to the kidney are freed by entering Gerota's fascia and baring the superior pole of the right kidney. When mobilizing the adrenal gland, it is beneficial to delay freeing the caudal attachments of the adrenal gland to the kidney to be the last step of mobilization, reason being that once Gerota's fascia is entered, a significant amount of unwieldy perirenal fat narrows the surgeon's field of view. Unlike the right adrenal gland, the left adrenal gland lies in a more medial position with respect to the upper pole of the right kidney. There is not a retroaortic portion of the left adrenal gland as there often is a retrocaval portion of the gland on the right side. One must be aware that when the adrenal gland is on traction before ligating and transecting the adrenal vein, the inferior vena cava may be kinked and not course in the expected direction cranial to the adrenal vein. One must also be aware of the fact that if overzealous dissection is carried out too cranially along the inferior vena cava, one may approach the hepatic veins. The left adrenal gland, similar to the right adrenal gland, lies cranial to the upper pole of the right kidney. Unlike the right adrenal gland, the left adrenal gland lies in a more medial position with respect to the upper pole of the right kidney. Medially, just as the right adrenal gland lies contiguous with the inferior vena cava, the left adrenal gland lies in close proximity to the left, lateral boarder of the aorta. There is typically more clearance between the aorta and the left adrenal gland than there is between the inferior vena cava and the right adrenal gland. There is not a retroaortic portion of the left adrenal gland as there often is a retrocaval portion of the gland on the right side. Superiorly, the adrenal gland abuts the under surface of the spleen. Laterally, the adrenal gland is bounded by the most inferior portions of the diaphragm and the lateral abdominal wall. Posteriorly, the adrenal gland lies atop the psoas muscle. Unlike the right adrenal vein, the left adrenal vein drains into the left renal vein. The blood supply to the left adrenal gland is similar to the right side: branches of the inferior phrenic artery, the left renal artery, and perforating branches of the aorta. Again, these named arteries are rarely appreciated. Unlike the right adrenal vein, the left adrenal vein drains into the left renal vein. The adrenal vein drains into the renal vein in a more medial position relative to the gonadal and lumbar vein. The adrenal vein is visualized by partially skeletonizing the renal vein. When this medial dissection of the renal vein is carried out, the insertion of the adrenal vein will be seen on the cranial margin of the renal vein. The anterio-medial adrenal gland lies very close to the tail of the pancreas. If this relation is not understood and if there is a prominent tail of the pancreas, it is easy to confuse the initial dissection of the adrenal gland with the tail of the pancreas. The anatomical relation of the adrenal gland to surrounding structures is the same as described via the transperitoneal approach. However, the approach to the adrenal vein is quite different. Unlike the transperitoneal approach, the left renal vein need not be dissected at all. Rather the adrenal vein is seen just cranial (to the right on the television monitor) to the pulsations of the left renal artery. Furthermore, it courses approximately 0.5 to 1 cm anterior and parallel to the horizon of the anterior psoas muscle. The mobilization of the adrenal gland is similar to that described for the right retroperitoneal approach. Specifically the gland is freed of its cranial attachments to the peritoneum underlying the spleen, then the anterior-medial attachments to the peritoneum, and lastly, cranially from the superior surface of the bared kidney. When dissecting the posterio-medial attachments of the adrenal gland, it is advisable to exert lateral traction (toward the surgeon) on the adrenal gland so that just the attachments connected to the adrenal gland are divided. This step further minimizes the chances of injury to the superior mesenteric artery.